Virgin Active South Africa’s national product development manager, Ceri, is the guy behind all the classes you love, from Rumble to the Grid to Pound. He travels the world looking for what’s hot in the biz of fitness and makes sure we get it fresh in SA. He’s also the OG of fitness instructors with 30 years in the industry and more energy than a Duracell bunny. And his signature jump-around warm-up is one of the highlights of FNO! Are you ready to boogie? WIN! WIN! WIN! 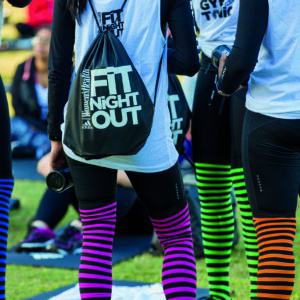 Buy your FNO ticket and you automatically go into a lucky draw to win BIG with Virgin Active! You could win a six-month premier Virgin Active membership valued at R6 000 that gives you access to 120 health clubs nationwide, PLUS 12 personal training sessions valued between R2 500 and R3 000! Click here to enter now. As if QueenFitnass needs any introduction. The first-ever winner of our Next Fitness Star competition is a real-life Wonder Woman and our ultimate #FitSpo. Her regular clients include celebs, sports stars, politicians and high-flying business execs who are members of the exclusive Alice Lane Virgin Active Collection club in Sandton. Now you get to train live with SA’s fitness queen, right here in Cape Town, and experience that one-of-a-kind Maps magic for yourself. Are you ready for Maps? Click here to book your spot now! Whether you regularly devote four hours to a classic Bollywood film or not, who doesn’t enjoy the dancing? The music, the moves and the vibrance of Bollywood are the definition of feel-good fun and Veena has captured all that and turned it into a fitness class like no other. Veena has been a dancer almost her entire life and has taught Indian dance for decades. But she’s also a fitness fanatic. Now she’s brought her two loves together in a seriously fun workout that’s unlike anything you’ve tried before. Even if you have the rhythm of an antelope on ice, you’ll have such fun whirling and twirling around to infectious Bollywood tunes. Don’t miss out! Get your tickets right now! One of our 2017 Next Fitness Star finalists, Seugnet is a ballet teacher, yoga instructor and…stuntwoman. While she keeps it pretty traditional in her adult ballet classes right here in Cape Town, her love of movement comes through in her yoga classes, where she loves to challenge her students. If you’ve ever wanted to master inversions or arm balances but were too afraid to try, Seugnet is your woman. She’s teamed up with fellow yogi and movement specialist, Lara, to bring you a strength and mobility-based session that’ll teach you new skills and challenge your muscles in a whole new way! Are you ready to get strong and flexi? Click here to get your FNO tickets. WH cover star and Next Fitness Star finalist, Takkies, is back on the Cape Town bill with her one-of-a-kind dance class that’s 100% sass and all the body positivity. No need to bring your heels – you can still booty pop, shake those hips and master your struts and hair flicks like a pro. Look out, Jackson Hall, our girls are coming in hot! Are you ready to booty-pop? That’s right, baby, the boys are back to end your night on a high! Who said you need a treadmill to experience the energy, endorphins and fat-burning fever of a S.W.E.A.T 1000 class? Get ready to work harder than you’ve ever worked before with all the lights and live DJ action you’d find at a rock concert. You’ll leave drenched, but with the biggest smile, guaranteed. Get your Fit Night Out tickets now. What’s a workout party without a live DJ? With JungleGum on the decks, you can get ready for a jol! Don’t miss out! Get your tickets at Quicket.co.za today!